Ayman Al-Zawahiri, successor to Osama Bin Laden as Al Qaeda chief, has announced plans to "raise the flag of jihad" in South Asia, particularly India. Zawahiri said that the new wing would save Muslims from injustice and oppression, and bring relief for Muslims "in Burma [Myanmar], Bangladesh, Assam, Gujarat, Ahmedabad, and Kashmir", according to Indian media reports. In a video released by Al Qaeda, Zawahiri has made two references to the western state of Gujarat, the home state of India's Hindu Nationalist Prime Minister Narendra Modi who is widely believed to be at least partly responsible for the 2002 riots in which thousands of Muslims were massacred in Gujarat. Can Al Qaeda Succeed in India? Can Al Qaeda succeed in "raising the flag of jihad" in India? 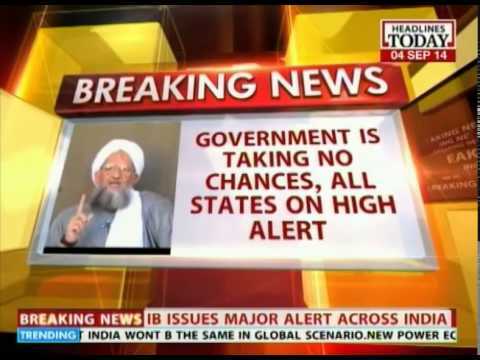 Are the conditions in India conducive for Al Qaeda to take root? These are the important questions being raised among south Asia watchers and analysts. In my view the answer to these questions would depend mainly on how the Modi government reacts to this threat. What is the State of Muslims in India? It is not a secret that there is widespread discrimination against Indian Muslims in education, employment and housing. India's criminal justice system is clearly stacked against Muslims and other minorities. Muslims make up 13% of India's population but 28% of Indian prisoners. Similarly, Christians make up 2.8% of India's population but 6% of India's prison population. Meanwhile, the newly elected parliament has just 4% Muslim representation. There is ongoing ghettoization of Muslims in Indian cities. Muslims are routinely and systematically excluded from living in nice urban neighborhoods. Indian Muslims are now worse off than the lowest-caste Hindus, or Dalits, in terms of education and employment. The 2013 update of the Sachar Commission report shows there has been little improvement for Muslims since the original report published 2006. Will Hindu Nationalists Frame More Muslims on Terror Charges? Hindu Nationalists and their allies in the Indian government machinery have used the US global war on terror as a convenient cover to launch a concerted campaign of terror against Indian Muslims. Large numbers of Muslims in various parts of India continue to languish in jails on trumped-up terror charges, suffering brutal torture as well as routine insults to their religion by police officials, according to Indian journalist Yoginder Sikand. In addition, several Hindutva terror groups, and their affiliates, have carried out a number of bomb blasts across India in the last few years, and tried to pin the blame on Indian Muslims or the Pakistan's intelligence service ISI. A retired high-ranking Indian police official S.M. Mushrif has described nearly a dozen blasts conducted by Hindutva terror groups of different stripes. He argues that a section of India’s intelligence services, a small group in the armed forces and parts of different state police forces have been compromised and infiltrated by these elements, a development that bodes ill for the future of the country, and the region. Conditions already exist today, especially after the recent success of the Sangh Parivar in India, for Al Qaeda to succeed in persuading many resentful Indian Muslims to join its "jihad" in South Asia. If the latest video threat from Al Qaeda chief intensifies framing of innocent Muslims on terror charges by the new Hindu Nationalist government led by Narendra Modi, then the chances of Al Qaeda's success would dramatically increase in India. Post by The phenomenon of Pakistan. Can Hindutva Terrorists Spark India-Pakistan War? AQ cannot and will not succeed even in Muslim Majority countries like Pakistan. It will get a good thrashing in India as well. Few basics- Al-Qaida is gaining strength not because of poor Muslims. Most of Al-Qaida is made of well educated and rich youth.Poor people have other priorities- like earning their bread and taking care of their families. If there is wide-spread discrimination of Muslims in India, how is it that Pakistan is more effected by terrorism then India? India is a secular democracy. Muslims can reach the top-most positions and hold high positions in all walks of life. You can have any number of examples- Film field, technology, defence, arts, Education, agriculture, software, industry etc. Muslims tend to have larger families- so miss out of development. Muslims do not have reservation, due to the fact that they are not downtrodden. They have suffered after the fall of Mughals. Even the descendants of Akbar are in bad condition of misery. No Muslim helps them, let alone Indian government. Compare this with Parsees of Mumbai and Gujarat. You cannot find a single poor person from their religion. This is because they have pride and take care of their fellow community. Poor Parsees are given handsome allowances from common fund. Their children are given free education and sometimes they get free housing if required. Muslims on the other hand do not co-operate with other Muslims on any issues. This is due to low education, again. India is a fast growing country (in population volumes), so government cannot help everybody. But all said and done, Muslims from India are not as violent as they are in Pakistan and Arab nations. So Al-Qaida cannot succeed. Muslims here know that if they work hard- they can succeed. Ras: "It will get a good thrashing in India as well. Al Qaeda will fail only if Modi's Hindu Nationalist govt do not aid its recruitment effort by framing more and more innocent Muslims on trumped up terror charges. AQ's intent is sure to make internal security a new priority for Mr. Modi, who already has a full plate. It remains to be seen whether his government will prove any more successful than previous governments in addressing the root causes of the Naxalites' success -- a failure to meet many Indians' basic needs, and the grinding poverty that endures in much of the country. This is happening while the world is transfixed at the rapid rise of the IS, and aghast at the inability of any country to stop its march across the Levant. The birth of the world's newest nation and its newest failed state --the IS -- and the ability of groups like AQ to simply declare what they intend to do, almost at will, have served to demonstrate just how feeble the established international order has become. The truth is that Syria and Iraq are slowly disintegrating. Short of committing hundreds of thousands of troops to both countries in a lengthy and sustained battle -- which will not happen -- it seems likely that, at a minimum, IS will retain most of the gains it has made, and may claim even greater territory in Syria, Iraq, and greater Kurdistan in the weeks and months to come. Oh, of course! Of course, the deck is stacked against muslims. The poor muslims are victims of a conspiracy by Hindutva folks. Of course it is not the muslims fault - that they do not try to integrate themselves into mainstream society. It is not their fault that they do not get educated in fields that would get them meaningful jobs - what better education than a madarassa. It is not their fault that they cheer for Pakistan in India-Pakistan matches. Of course it is not their fault that they consider themselves Muslims first, Indians second. Of course, it is natural that their entire worldview is ruled by religion. Poor victims - I don't understand why secular societies view them with suspicion. Anon: "Of course it is not the muslims fault - that they do not try to integrate themselves into mainstream society." If we repeated lurch from financial crisis to crisis, Al Qaeda-TTP will soon take over. We must stabilize the macroeconomic indicators. This begins with moving towards a much, much HIGHER savings rate.